Stephen Ratcliffe and composer Edward Schocker perform Ratcliffe’s 1,000-page poem 'Remarks on Color / Sound' on May 16, 2010, at the Marin Headlands in Northern California. Left to right: Zachary Watkins on electronics, Dylan Bolles on winds, Stephen Ratcliffe, Suki O’Kane on drum, and Edward Schocker on glass bowls. Maybe the mountain lion droppings on the hiking trails or the rocky splash shorelines make the Marin Headlands seem remote, but geographically, this place is a cuticle on the Golden Gate Bridge’s big toe. 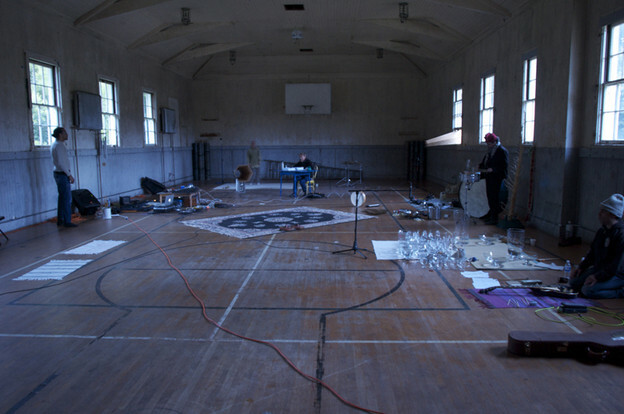 And here you can find Headlands Center for the Arts, which hosted Remarks on Color / Sound, in which Stephen Ratcliffe and composer Edward Schocker performed Ratcliffe’s 1,000-page poem on May 16, 2010, in the Gym Studio at the Center. Bay Areans who missed the performance could use the remote location as an excuse, but certainly not the time of the performance. Locals had fourteen hours to stop by, sunrise to sunset. That’s like seven poetry readings combined. As press for the event describes it: “The reading of the poem will accompany sound, light, movement, and sculpture in an open dialogue with the architecture of the surrounding space.” The philosophically vague “space” mentioned is a converted military complex in a recess of eucalyptus and concrete bunkers, most nooks replete with ghost stories. Remarks on Color / Sound was in the gym, where national guardsmen once played basketball while on break from protecting the coast, circa first half of the twentieth century. Ratcliffe was stationed within, at a simple wooden desk. The arts center is not exactly squatting in a decommissioned military base. The nonprofit is a breathing organism of Golden Gate National Park, which was incorporated in the early 1980s when local artists traded renovations for studio time and then mustered up a board of directors. It functions as a residency for local, national, and international artists, writers, and musicians, like Schocker, who worked in the gym several days a week for six months in 2010. In Remarks on Color / Sound, Ratcliffe read the 1,000 pages he wrote in 1,000 consecutive days beginning October 27, 2005, and finishing April 9, 2008. I sat through two months of the poem, at 11 a.m. and then again at 4 p.m. Knowing that the reading and music would last fourteen hours mediated my interaction as fragments not entirely lost from the shape of the whole. I was following a trace of writing from several years ago deposited into the gym. It was a crazy clock of invisible hand-me-downs cast on mountains staring at me through tall windows. The poetry at this performance came to represent a place to enter and leave. Unless you were there at the very end, you had to leave the poetry, as opposed to the reading being announced as over. Schmoozing was at an all-time low. A fellow audience member, while in the made-from-scratch-all-organic mess hall, mentioned to me the off-putting hierarchy of a durational performance. How fourteen hours may be more intimidating than inviting, making the audience feel inadequate or left out, and as a result, noncommittal. Remarks on Color / Sound did not pander to the audience used to a time of trends known as participation. The performers took eating and resting breaks to stay afloat; some wore their pajamas. I saw Schocker at one point roaming away from the gym with a hot water kettle, the plug scraping along the ground. As much as there was music and poetry coinciding, accompanying each other, a report on the event requires first some attention to Ratcliffe, the definitive star of the piece, with the most deadpan aria I’ve ever heard. This was a performance of active and accidental editing. It brought up the question of how is it as much the reader entering a long piece and leaving it as the writer selecting the best parts to read out loud. At times, there was no audience in the Gym Studio. Who was listening to this poetry then? The audience for Ratcliffe’s work encompasses the insistent generalities of landscape being written of and the space the work is read in. Ratcliffe’s formal consistency — a daily production of poems — lives just up the coastal trail from Headlands, in a studio with a breathtaking view. Remarks on Color / Sound summoned spirits who refuse selection from a poetry of practice and then summoned spirits who denounce the conundrum of editing. Can editing be as rhythmic as waking up, as routine as taking in the scene and air immediately around you? And the relief, what’s edited out, is the time you are not inside a poem’s space? In other words, how do you edit Stephen Ratcliffe? You walk in and out. Left to right: Zachary Watkins on electronics, Suki O’Kane on drums, and Stephen Ratcliffe. It would be unfaithful to a full report not to start talking about the soundscape. Ratcliffe’s reading was embedded within the work of four musicians led by Schocker. A partial inventory of their instruments is as follows: wood flutes, enlarged glass vases, pots, rice, grills, walkie-talkies, speakers, a mixer, and a bass guitar. The musicians worked with their toy store at a rotation of fresh liberty to build accompaniments to solo breakdowns. The music’s randomness was not nearly as calculated as a Merce Cunningham score. It seemed the musicians were responding to what Ratcliffe was reading. The arrangement of the musicians on the basketball court was orbital to Stephen’s desk, but everyone seemed to be stuck in a visible earth tilt: backs were turned to each other like it was gravity’s fault, not bad manners. Perhaps these postures brought deviance to the switchboard: sometimes Ratcliffe’s words were not audible, but other times his voice was adjusted to maximum fuzz blast. I even had the feeling that the musicians were spiteful of the 1,000 poems’ calm constancy. I’m feeling stuck on the words collaboration and interdisciplinary in describing my experience at this performance. This naming of the performance feels strained, like a tortoise and hare roleplay might, which brings up the risk of competition among mediums when they share the stage. The musicians achieved the problematics of democratizing instrumental sound with language sound by demonstrating that not all voices are equal. This echoed the experience of reading such a long work as Ratcliffe’s, how parts get lost and pieces get held onto. You’re given the illusion of control in a very large system. Stephen announced each page with an easy-to-decode numbers scheme of month, then day. I heard no years. The date announcement is a pause where your own brood of birthdays, anniversaries, and holidays latch on to the date. Personal connotations bump into Ratcliffe’s subject, the three-dimensional audiovisual from a window. A resonating moment was the line “sound of jet passing overhead,” repeated and landing on the aftermath of September 11. 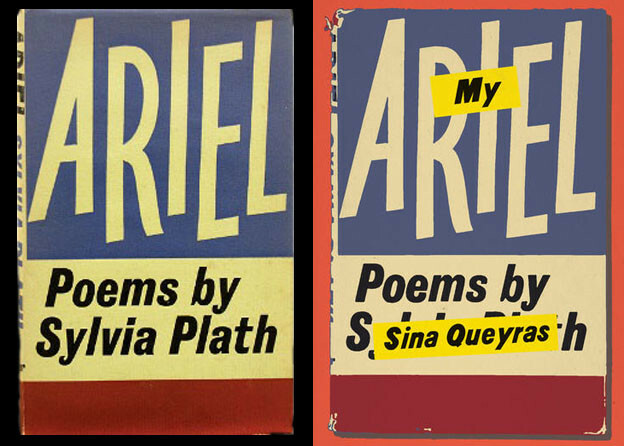 This is not a timeless poetry. The date of the poem makes listening to the poem uncomfortable; it is unafraid of what the fact of time does to us. Instrumentals at the Marin Headlands reading. Then there is the page: something of a technical necessity at a durational reading. Don’t even try to memorize this or look up at the audience to connect. The poem in Remarks on Color / Sound is located in the act of reading the 1,000 pages. I locate the poem as a region on a mind map where poems are not singular places. Which makes Ratcliffe’s poetry, in refusing a selection, insist on the performance as its wedding night. Remarks on Color / Sound becomes a sort of did you hear about this event poem as opposed to a did you hear it’s very difficult to fund the printing of a book of 1,000 pages poem. And this performance becomes a legend to drag your cursor over. But what about the power of institutions to promote the documentation of performance art so that it lives past the sparsely attended event? We depend on documentation just as we depend on performance art to do the unusual. I don’t think that makes undocumented work a spectacle. And I don’t think it makes documentation of an event any less complicated. On September 25, 2010, the Marina Abramović Institute West in San Francisco hosted 4 Better, 4 Worse, by Lital Dotan and Eyal Perry, an homage to Abramović’s 1974 performance Rhythm 0. Rhythm 0 was the piece where Abramović got a gun pointed at her head. She put the gun on a table with seventy-one other objects the public was asked to use on her. Back to reality: at the famous performance artist’s nonprofit, the stage was a woman on an air mattress, plus anything the step-right-up audience felt like doing to her with household objects mounted on a wall nearby. A cluster of people behind two video cameras on tripods built the mirroring stage. This wall-o-documentation made me feel like a dog with an invisible fence collar zapping. Then there was the official photographer who looked like he was on the court at Madison Square Garden and then there were all the people the official photographer told me he couldn’t, or didn’t care enough to, stop from taking pictures of the performance. And this was an homage to canonically spectacular performance art, the type where you wait for blood. In human/nature, Ratcliffe and Schocker underestimated the time it would take to get through the work by five hours. Ratcliffe recalls, “Sometime in the middle of the night I realized I was the only person in the room who was still awake.” And yet, how is that different than a poet’s potentially weak moment of unconnectivity with the words on the page to the people in the folding chairs at a poetry reading? Stephen Ratcliffe’s durational poetry readings are not necessarily radical but real to his work. And what would poetry readings start to look like if the formal aspects of performance started to speak this fluently to what the work wants and needs? One thousand pages of reading at the Marin Headlands.